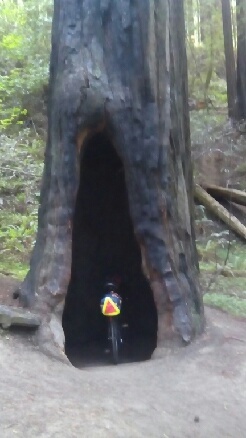 Biking Dude - A Tree Ate My Bike! Had a decision point in Eureka today, after biking the fifty miles there from camp. Would I push on to the campground eighty miles away and do two more big century days to get to SF a day earlier, or would I reign myself in and start doing eighty/ninety mile days? I decided that I didn't want to push myself to hard, so I headed to the campground that was "only" another 45 miles from Eureka. First, I planned out places to stay the next few days, and called up the state parks where I was planning to stay, to confirm that they have hiker biker sites. I also stopped at subway for lunch, and possibly my new favorite grocery store, Winco. They have pretty darn good prices, and bulk food (like banana chips and trail mix) that you can get however much or little as you want. The last fifteen miles to camp were along the avenue of the giants, a scenic alternate to 101 that winds through redwood forests. My campground in right in the middle of the forest, it's pretty incredible. Met up with Stewart and Alison at camp, also Mike and Katie who I had passed on the road. Teresa came into camp a while later. Glenn, a camper in a nearby site, brought over some beer for all the bikers. He owns a bike shop in Santa Rosa. What a guy! I've started seeing signs for San Francisco. They went from over three hundred miles to under today. Things are coming to a close very soon, but I still have many miles to travel. The redwoods are fantastic, really happy to be camping here tonight.